Just bought a new house and you want to change the flooring of your kitchen? Well, in the current market for home décor, customers have a wide range of flooring choices to enhance their kitchen's appeal. Wood, ceramic, laminate - you name it! The ease of installation, appeal and maintenance are primary factors that will help you determine the best flooring for your kitchen. The most recent flooring option is cork flooring, a recyclable, environment-friendly alternative that not only has a great appeal, but is also ideal for people that have problems with the feet and the legs. Its soft and smooth surface helps to reduce stress on knees and ankles. The tongue-in-groove design of most cork flooring makes the installation process pretty easy. This amazing and robust product is available in a variety of colors, but should be avoided if you have pets in the house that may scratch the flooring surface. The amazing appearance and the non-artificiality of hardwood flooring is the main reason why more and more customers prefer it as an ideal flooring option. Compared to ceramics, it is warmer, easier on ankles and joints, and can be cleaned easily using a plain wet mop. Your kitchen floor can now complement the most used room of your house, e.g. the dining area- thanks to the variety of wooden flooring available on the market! Another increasingly popular form of reusable, eco-friendly product is bamboo flooring. Apart from its environmental contribution, its warm and beautiful wooden outlook greatly enhances the look of your kitchen area. If you already have a wooden kitchen cabinet, it is better to choose some other alternative rather than hardwood flooring because it will give a monotonous look to your kitchen. Some wooden flooring comes with excessive graining patterns that may depreciate your design. Hickory and Oak are obvious examples. 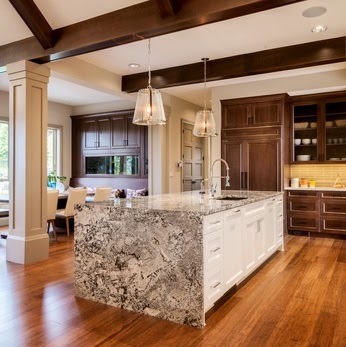 However, you can always minimize the graining effect and give a more neutral look to your kitchen using darker-stained floors and contrasting furniture. For instance, lighter cabinets contrast well with darker floors and medium-to-dark counter tops. With dark floors, the visibility of dirt and dust is very low and with light floors, your kitchen will appear a lot bigger in size. Hence, it is better to choose a color that is neither too dark nor too light in combination with a dark cabinet and medium/light counter. This provides a rich and balanced look to your kitchen. Ceramic tiles are another popular flooring choice for the kitchen. It enhances your kitchen by offering an assortment of decorative looks by integrating different interesting colors and patterns into your design, that remain tied into the floor through tile backsplashes. The major drawback, however, is the hardness of the ceramic surface, making it harsh on your feet, and the difficulty of removing food stains from the grout lines of the floor. However, the hard surface, especially the ceramic backsplash, is easy to clean. Ceramic tiles are ideal for Southwestern kitchens, giving them a local and traditional feel. Laminate flooring is another excellent flooring alternative available at an affordable price. Like cork flooring, it comes with an easy-to-install and easy-to-clean feature and a variety of tongue-in-groove designs ranging from wood to stone. With a vapor barrier installed below, the flooring looks and works amazingly in your kitchen. Even with the alternatives, you should consult a flooring expert before you make a final choice. The location and the type of your house are important determinants of your selected alternative. Hence, choosing the best flooring not only enhances the look and feel of your kitchen, but also eases the installation and the maintenance of your kitchen flooring for years. More useful information about renovating your kitchen, you can get here. To see how you can tell when the right time to renovate your kitchen is, go here.